Mechanical reliability is different from most electronics in that the hardware, such as gears, bearings, or joints, commonly have a very time or usage dependent failure rate. 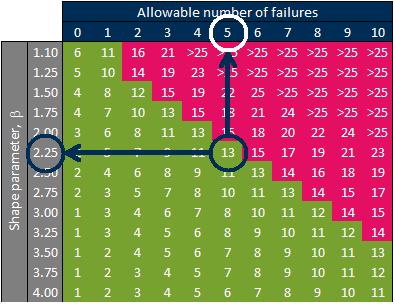 You cannot assume a constant failure rate and develop a test plan using chi-square distribution. Developing a test plan requires that you have some knowledge of one of the Weibull parameters, such as the shape parameter, beta. If you assume a shape parameter and quantity of test articles, you can estimate the number of hours required for the test and the number of failures that can be expected. Once the test is completed, use the time to fail data to determine both parameters from the Weibull distribution. Then go back to the test plan and see what you have truly demonstrated. So, basically, you make some assumptions; perform the test; then return to the plan and validate the assumptions and recalculate the reliability of the hardware. plan matrix" is shown to the right. Alternative shape parameters are along the vertical axis and the number of allowable failures is across the top. For the given test time allocated, characteristic life desired, and confidence level, the test quantities are shown in the body of the figure. If the number of units under test are 13, then you can see how many failures are expected for a given beta. For example, if there are 13 test units and the shape parameter is 2.25, then I will pass the test with 5 or fewer failures. At periodic intervals equivalent to one year of real life usage, motor currents, voltages, speed of movement, and vibrations were measured. Other than the temperatures, these all give information about the increase or decrease in the level of frictional force. An increase in the current or amplitude of the vibration can indicate degrees of wear. 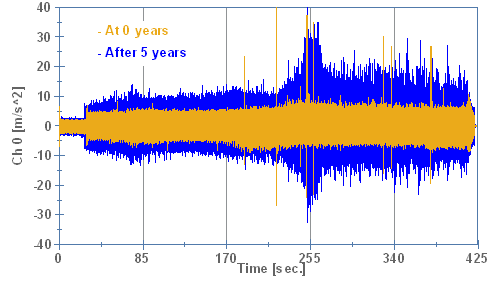 Observing vibrations in the time domain provides information about where in time (physical position) a significant event occurs. If a high amplitude vibration occurs after 100 seconds into the characterization, that corresponds to a specific position and indicates where to look for worn hardware. 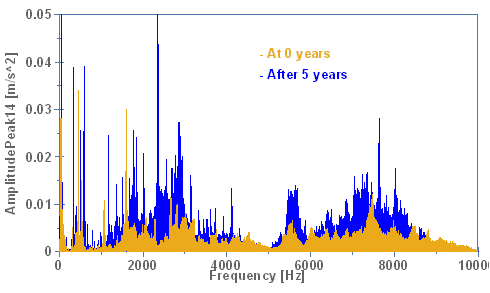 Additionally, increased amplitudes at different ages, as shown below, indicate wear that is related to the product use (age). The accelerations are converted into the frequency domain to show which frequencies have increased. From the gear ratios, bearing diameters, number of balls (rollers), diameter of the balls (rollers), the ID of the outer race, and the OD of the inner race you can calculate the frequencies you expect to see when the machinery is rotating at a fixed speed. Reviewing the accelerations in the frequency domain indicates which of these elements are wearing out, are broken, or are damaged.